Katashida-jo Castle was the center of the territory of Aso Daiguji clan in the medieval era, surrounded by the Sagara clan of Yatsushiro area and the Nawa clan of Uto area. In the Warring States Period, this was one of the most influential areas in the late 16th century South Kumamoto. From Muromachi Period to the Warring States Period, Katashida-jo Castle was the strongpoint for the Aso clan. The castle consisted of a mountaintop castle and a village, which was the typical style of castle in the medieval era. Katashida-jo Castle, also known as "Akahachio-jo Castle" and "Setao-jo Castle," was designated as a national historic site in 2007. 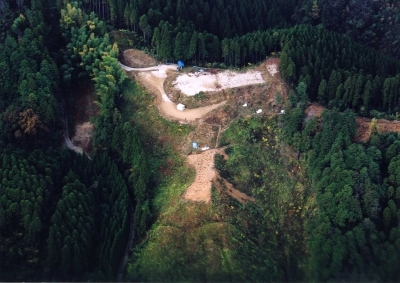 The castle site is located on top of the hill, 236 meters above sea level. There are 11 enclosures on the rigde, and also 14 moats. Those moats include "unebori" style, a moat with hillings, and "shojibori" style, a moat with lattice-pattern hillings. There is also a ruin of the gate here. In the village and its surrounding areas, there are some place names that still remain from the old times such as "Ote," "Kuramae," "Kuragoten," "Misogoten,""Mainogoten." These names signify that the areas were residential areas for the lords and their retainers. Katashida-jo Castle played important roles for both daily life and defense. The castle fell in 1585 in the attack by the Shimazu clan of Satsuma.